As you type in the document, this plug-in displays a list of previously used words and highlighted words defined in EmEditor, and lets you select a word from the list to complete your typing. 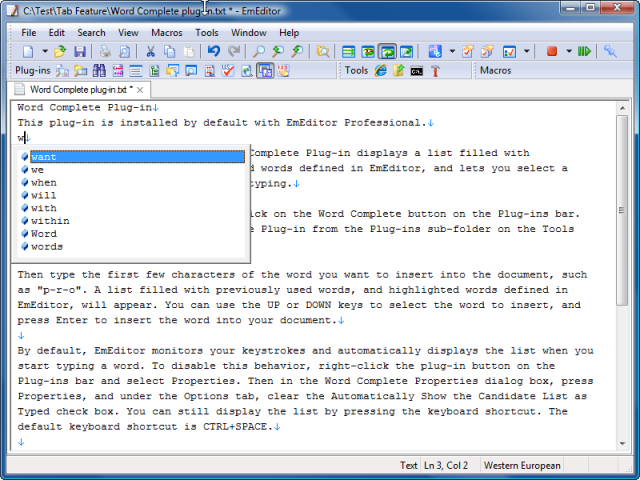 The Word Complete plug-in is installed by default with EmEditor Professional. As you type in the document, this plug-in displays the list filled with previously used words and highlighted words defined in EmEditor, and lets you select a word from the list to complete your typing. The Word Complete plug-in can also complete recently searched strings. To use the Word Complete plug-in: click the Word Complete plug-in button on the Plug-ins bar. Or on the Tools menu, point to Plug-ins, and then click Word Complete so that it is checked. By default, EmEditor monitors the keystrokes and automatically display the list when you start typing a word. To disable this behavior, right-click the plug-in button on the Plug-ins bar, select the Properties, and clear the Automatically Show the Candidate List as Typed check box. You can still display the list by pressing the keyboard shortcut. The default keyboard shortcut is CTRL + SPACE, but you can assign another keyboard shortcut by selecting the Keyboard tab on the Properties. The options in the plug-in Properties can be set for each configuration.